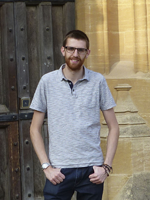 Peter is a DPhil candidate whose research interests focus on the histories and philosophies of geographical science. His work brings together a range of discourses including critical histories of exploration, geographies of science, postcolonial critiques of knowledge, as well as Arctic and Polar studies. Peter joined the School as part of an Arts and Humanities Research Council (AHRC) Collaborative Doctoral Award (CDA), and his research is conducted in collaboration with the RGS-IBG. Prior to joining Oxford, Peter completed a Master of Arts Degree in Geography (First Class Honours), and a Master of Research Degree in Human Geography (Distinction) at the University of Glasgow. His undergraduate dissertation examined the UK solidarity response to the 1973 Chilean coup and the events organised to commemorate this. His Masters thesis involved a critical reflection on the REF 2014 Impact Assessment and its implications for academic geographical study in the UK. Peter's DPhil project studies the historical geographies of the Royal Geographical Society (with Institute of British Geographers) and aims to understand how geographical science was practiced and articulated in Greenland between 1880 and 1939. From its establishment in 1830, the RGS was to become the central node in a truly global network of science and exploration for well over a century, playing a significant role in both facilitating and shaping expeditions to 'the farthest ends of the earth'. Many studies into the history of this multifaceted institution have revealed the Society's status and influence in nineteenth century Britain, and have examined the close relationships it maintained with the British Admiralty and the UK Government. Also of interest to geographers have been the ways in which the RGS was pivotal in constructing particular narratives and imaginaries relating to regions of the world and translating these into popular understandings - constructions of Africa in particular have received a great deal of attention from scholars of exploration, colonialism and imperialism. However, much less attention has been given to the role of the Society's complex involvement in the earth's Arctic Regions, and it is this gap in the literature which this DPhil project will aim to correct. By drawing together a range of approaches, including history of science discourses, critical discussions on the age of exploration and also reflections on the histories and philosophies of geographical study, this research will shed light on the Royal Geographical Society's intriguing involvement in the exploration and scientific recording of Arctic Greenland in the late nineteenth and early twentieth centuries. Of particular interest are the networks and connections that were established between the RGS and other international scientific societies at this time, and the epistemological consequences of this 'cosmopolitan science' will be explored. Little was known of this great white expanse, and expeditions into Greenland's interior were set against continuing narratives of mythology, mystery and speculation. As the Arctic regions become ever more relevant in modern-day issues over climate change, resource extraction and geopolitical sovereignty, understanding historical discourses relating to Greenland and how these frame the Polar North in particular ways is becoming an increasingly important task. Martin, P.R. (2017) Imagining the Arctic: Heroism, Spectacle and Polar Exploration, Huw Lewis-Jones. I.B. Tauris, London (2017). 433 pages, �75 hardcover. Journal of Historical Geography [In Press]. Martin, P.R. (2017) Lines in the Ice: Exploring the Roof of the World, Philip J. Hatfield. The British Library, London (2016). 224 pages, �25 hardcover. Journal of Historical Geography, 57: 111. '…with "confidential" underlined seven times…: Managing and Mediating Knowledge at the Royal Geographical Society', RGS-IBG Annual International Conference, London, UK, Aug 29 - Sept 01, 2017. 'Fram: Fridtjof Nansen and the New Geography'. British Society for History of Science Annual Conference, York, UK, Jul 06-09, 2017. 'Fram: Fridtjof Nansen and the New Geography'. Nordic Geographers Conference, Stockholm, Sweden, Jun 18-21, 2017. '"Snowland Folk": Constructing the Arctic through Children's Pedagogical Literatures'. International Congress of Arctic Social Scientists, Ume�, Sweden, Jun 08-12, 2017. '"Snowland Folk": Constructing the Arctic through Children's Pedagogical Literatures'. RGS-IBG Annual International Conference, London, UK, Aug 30-Sept 02, 2016. 'Re/Fram/ing Geography: Fridtjof Nansen at the Royal Geographical Society c.1888-1914', Histories, Cultures, Environments and Politics research seminar, Scott Polar Research Institute, University of Cambridge, UK, Nov 27, 2017. Making Exhibitions & Galleries. AHRC Collaborative Doctoral Partnerships Training Programme, National Maritime Museum & British Museum, UK, Feb 22-23, 2017. Practicing Historical Geography. Historical Geography Research Group, RGS-IBG, University of Aberystwyth, UK, Nov 2, 2016. Researching Objects & Material Culture. AHRC Collaborative Doctoral Partnerships Training Programme, British Museum, UK, Mar 17, 2016. Researching Archives & Documents. AHRC Collaborative Doctoral Partnerships Training Programme, British Library, UK, Mar 18, 2016.